and love always making them different. Take note this is the first ever St. Patrick's Day craft I EVER posted. 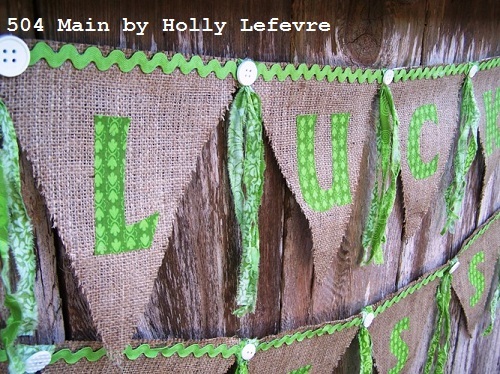 These banners - "Lucky" and "Blessed" were actually a custom order. and she hangs my banners in her windows! Read on to see the tutorial! This can be a "sew" or a "no sew" project! If you want to see how I make Drop Cloth Banners, my LOVE Banner tutorial shows you how. Thermoweb 17-Inch by 5-Yard Heat'n Bond Ultra Hold Iron-On Adhesive - I only use a small portion of this and at some craft stores you can buy smaller amounts or use a coupon! I use this because it bonds so well to the fabric and then in turn I encounter no fraying on the edges of my letters. NOTE: You could use Mod Podge or glue for a different effect. Ribbon, your choice, 2.5-3 yards, I prefer 7/8 or 5/8 inch grossgrain ribbon. 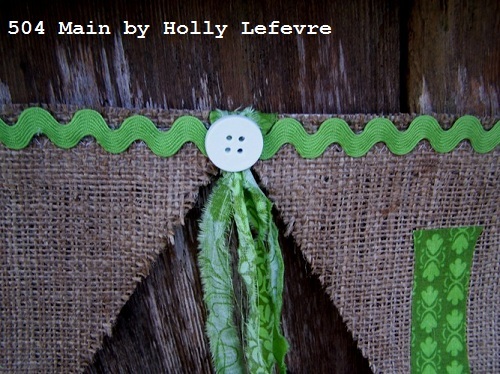 Buttons, trim, spools - depending on how you want to accent your banner. For this I used ripped fabric strips and big white buttons. Letters - I use chipboard letters from the craft store. Sewing machine (or hot glue gun or fabric adhesive). I prefer to sew my triangles onto the ribbon...but you can use buy pre-made triangles from Canvas Corp.
Cut 5 triangles for "Lucky" or 7 for "Blessed," 9" wide and 10" long. 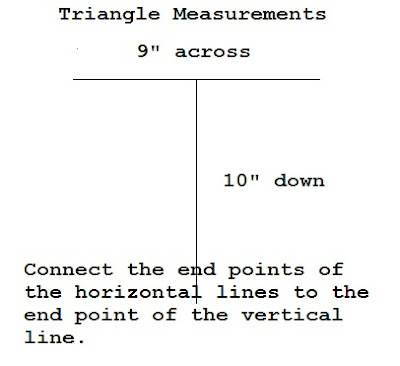 See above diagram from measurements. I like to use Mod Podge and "paint" around my triangle edges to keep the burlap from fraying. I technically paint the back side of the triangle. It does stiffen the burlap a bit...but not that much and keep the banners looking nice. Follow the package directions and adhere the Heat N Bond to the back side of the fabric. 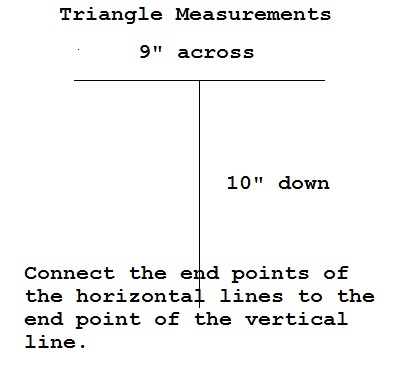 Carefully peel the back off of the Heat N Bond, and then position each letter on the triangle. Once happy with the placement, press into place with an iron. Sew (or use hot glue or fabric glue) the triangles onto a ribbon. Leave about 24" on each side of the first and last letter for hanging. Finish off by hot gluing buttons. I like just the fabric but this was a custom order and she wanted the buttons. I of course made a Lucky banner for my house too! 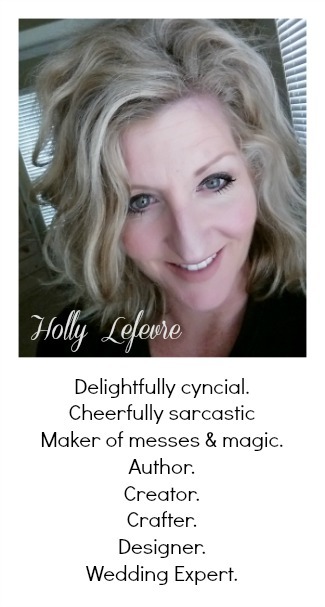 Check out my Birdhouse Banner! These are super cute! She us going to love them! I tried my hand at making a banner for our show booth. It turned out looking cute but i wouldn't sell it. Lol. I'm no eamstress and the stitching was uneven at best. :) Thank you for sharing this tutorial. I'd like to try my hand now at the no-sew version. Sounds much more user friendly for a gal like me! These are so sweet Holly!! 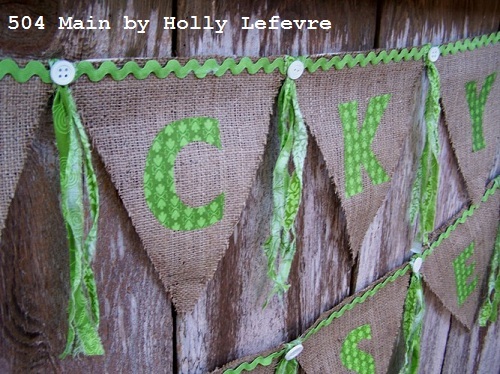 I love the burlap and those little rag ties are super cute! This is so cute, Holly! I need to make one for the patio. So cute!! And that birdhouse one is AWESOME!! Oh my gosh! I love those! You should sell them on your blog. I would buy one--for real. Those are so cute...especially hung together like that! So cute, Holly! I love the burlap background!